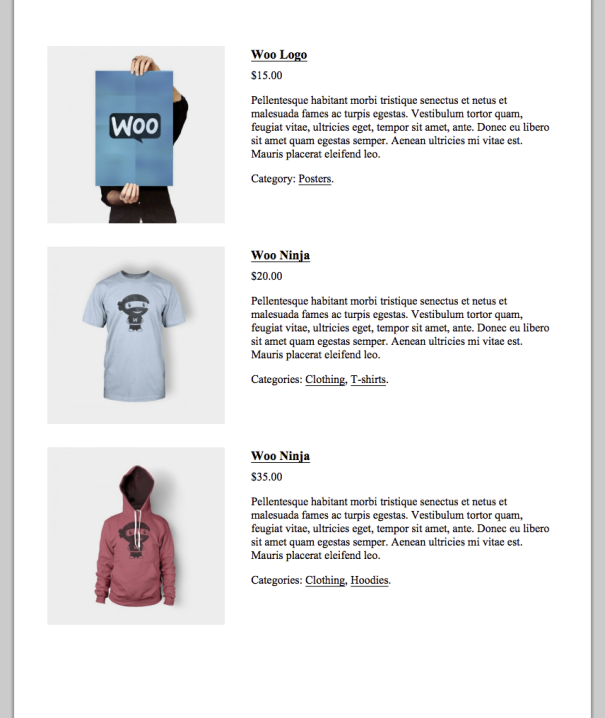 WooCommerce Store Catalog PDF Download allows shop owners to attach their own ready-made PDF catalog of products for customers to download. Customers can also download page-specific PDFs or a single product in detail. This feature is useful for customers that need to do offline viewing or printing or save info for future reference. 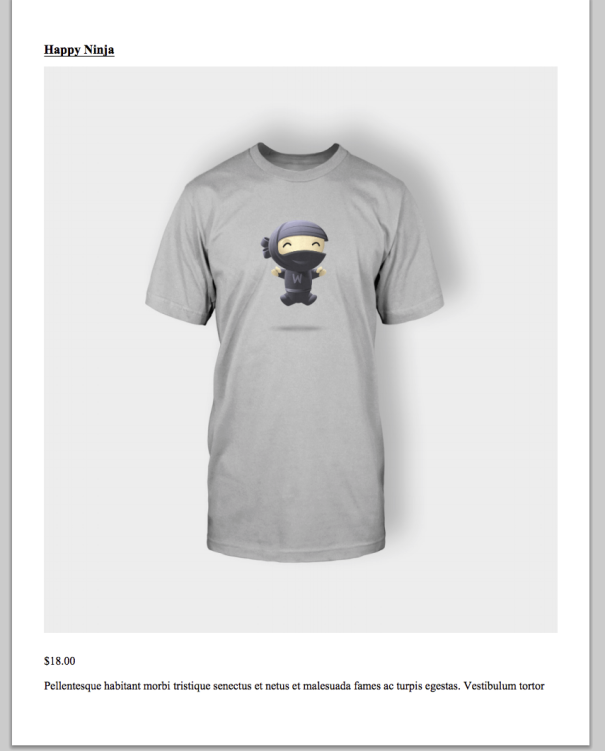 Go to: WooCommerce > Settings > Products > Store Catalog PDF. Upload a pre-made PDF catalog of your site/products and then allow customers to download it. It can be inserted anywhere you like with a shortcode. [wc-store-catalog-pdf]. Please review the shortcode section below for more information. Upload a custom logo that will be displayed at the top of the PDF document. This logo will also serve as a link back to your site when clicked. Be sure the setting Show Header is enabled to display the logo. Enable to show verbiage/text describing your company or other information in the header of the PDF. Enable to show verbiage/text, such as copyright or footnotes in the footer of the PDF. Choose which PDF layout customers will get when downloading the PDF. Grid format shows less information but displays more on a page; List format shows more information but less on a page. Below are samples of the generated PDF. Set what the download button text will be. The Catalog PDF download button displays on product archive pages and on product single detail pages. A screenshot of the PDF Catalog download button on the single product detail pages. A screenshot of the custom PDF Catalog download button on a designated page with shortcode. The dynamically generated PDF download button only generates a list of products that are in the page currently being viewed. It will not download the entire catalog of products, as this would create a site and server performance issue. 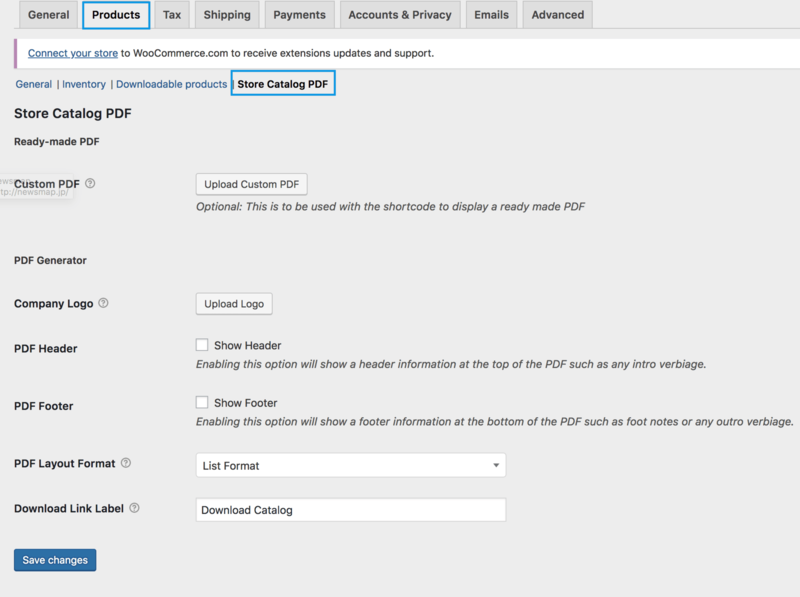 Using the shortcode [wc-store-catalog-pdf] to display a custom PDF download button anywhere shortcodes are allowed. Be sure you have uploaded a custom PDF in settings to use this shortcode. Optionally, you can set the download text to whatever you like with the shortcode parameter of link_label="Custom PDF Download"
Note: This is a Developer level section. If you are unfamiliar with code, hooks and templates and resolving potential conflicts, select a WooExpert or Developer for assistance. We are unable to provide support for customizations under our Support Policy. There are default templates you can use that generate the PDF. This way any changes you make are not overwritten when the plugin is updated. However you should take that one step further and create a child theme and put the template file in it so your changes are not lost when updating software. Learn how to create child themes at: Create Child Theme. This plugin comes with hooks you can use to manipulate for your requirements. While this section is mostly for developers, you can learn how to use hooks here Hooks API. Below is a list of hooks and a short description of what they do. do_action( ‘wc_store_catalog_pdf_download_before_product’, $product ) – fires right before the output of the product information in all layouts. do_action( ‘wc_store_catalog_pdf_download_after_product’, $product ) – fires right after the output of the product information in all layouts. do_action( ‘wc_store_catalog_pdf_download_product_attr’, $product ) – fires after the product’s meta has been outputted. apply_filters( ‘wc_store_catalog_pdf_download_orientation’, string ) – sets orientation of the generated PDF ( portrait / landscape ). apply_filters( ‘wc_store_catalog_pdf_download_size’, string ) – sets the size of the PDF ( letter / A4 / legal ). apply_filters( ‘wc_store_catalog_pdf_download_filename’, string ) – sets the filename that is generated. apply_filters( ‘wc_store_catalog_pdf_download_view_only’, string ) – for custom PDF download button, this sets whether the PDF will open up for view only or download it straight away. apply_filters( ‘wc_store_catalog_pdf_download_grid_image_size’, array ) – sets the image size for grid layout. apply_filters( ‘wc_store_catalog_pdf_download_grid_columns’, int ) – sets the number of columns you want displayed in grid layout. apply_filters( ‘wc_store_catalog_pdf_download_show_product_image’, html ) – outputs the product image. apply_filters( ‘wc_store_catalog_pdf_download_show_product_title’, html ) – outputs the product title. apply_filters( ‘wc_store_catalog_pdf_download_show_product_price’, html ) – outputs the product price. apply_filters( ‘wc_store_catalog_pdf_download_list_image_size’, array ) – sets the image size for list layout. apply_filters( ‘wc_store_catalog_pdf_download_description’, html ) – outputs the product description. apply_filters( ‘wc_store_catalog_pdf_download_product_meta’, html ) – outputs the product meta. apply_filters( ‘wc_store_catalog_pdf_download_single_image_size’, array ) – sets the image size for single layout. Yes, variable products will show all available attributes. This does not work with Composite Products (separate purchase) at this time. Not at this time. You can vote for this feature at the Ideas Forum. 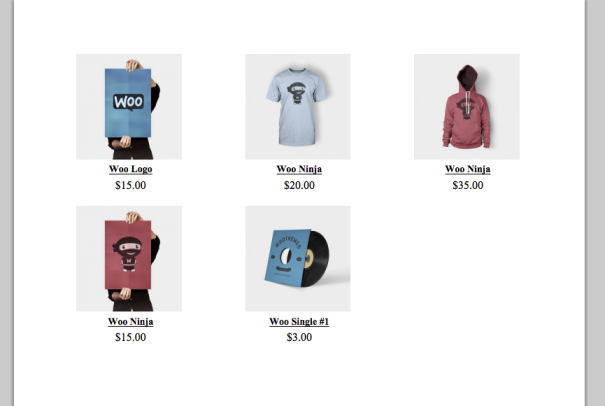 Does WooCommerce Store Catalog PDF Download work with variable products? Does this extension work with Composite Products? Does this generate a PDF of the entire store from the Admin dashboard to make a ready-made catalog?